So the last book I reviewed was Immortals of Meluha which was the first book of Amish Tripathi’s Shiva Trilogy. 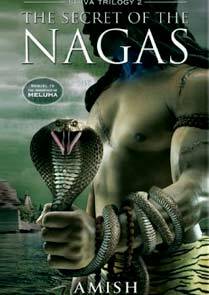 Today I am going to talk about the second book in this trilogy- The Secret Of Nagas. I knew I would have to grab the next part of the trilogy as soon as I finished the first book as the author had very smartly left it at a crucial point where you are just desperately waiting to turn the page and read on. Thankfully Flipkart came to my aid and delivered the book within 48 hours and I did not really have sit and keep imagining what was to happen next for too long. The Secret of Nagas as I have already mentioned takes off from where the story of Shiva, the tribal warrior was left in Immortals of Meluha. The book introduces us to a lot of new characters, takes you back to a few parts of the previous book and definitely answers alot of questions that might have have come up while you were reading the first part of the trilogy. I do feel that the author went for too much detail at a number of instances but just like Immortals of Meluha, Amish has yet again succeeded in maintaining a steady pace when it comes to the story and the narration. The end is not as strong and does not have the kind of impact that I was expecting especially after looking at the way the author had ended the first book. The Secret of Nagas definitely feels a little pale in front of Immortals of Meluha, but then I guess it was just that the first book was something that people had never read before and thus maybe my expectations were set a little too high.I just wish that the author had shown that control over the flow of the story that he had previously. But even then it is definitely one of the good books that I have read this year and Amish is one author I am going to keep my eyes and ears open for in the future as well. My verdict, go grab this book, actually the trilogy. I am currently read the third part and trust me, this is one set of books that should find place in your book rack.